AWB paged to assist ILB searching for a male in the water off Robin Hood camp, between Rhyl and Prestatyn. Man recovered before AWB launched. Classed as standby. Both boats were tasked by Holyhead Coastguard, to assist RSPCA inspectors and staff and local coastguards from Rhyl and Llandudno, to attempt to help a 10-metre Mimke whale, which had become stranded on Pensarn beach, Abergele. Crew members from both boats were ferried ashore and the assembled agencies then managed to turn the large mammal so it was facing the open sea, and finally managed to assist it to deeper water, where the lifeboats shepherded the whale even further out to sea.. The lifeboats were released from their task and returned to station at 1800. The crew pagers were activated for the AWB to launch to a suspected male in the sea off ASDA Kinmel Bay. A male was in police custody after being escorted off the beach, and he said another male was in the sea as well. The AWB launched and proceeded to Kinmel Bay to start a close inshore search between Rhyl and Abergele for the person in the water. After about an hour of searching, police told Holyhead Coastguard there had been an attempted robbery at ASDA, with the male being one of the suspects, The car they were driving was apparently stolen. It is thought the person in the water was a decoy to keep police away from the crime scene. As the AWB was finishing a search leg about 0.25 miles off shore, the units on this tasking were diverted. At the request of North Wales police, Holyhead Coastguard again requested the AWB to launch to carry out a search in daylight hours between Pensarn and Talacre. This was done and the search continued with nothing being found. The AWB was released and returned to station at 1305. The crews were just starting to wash down after the normal; exercise. The boat was being brought up the slipway as the pagers were activated by Holyhead Coastguard. A motor cruiser on passage from Conwy to Rhyl, had suffered complete engine failure off Abergele, 4 miles to the west of the station. The AWB was launched within 5 minutes, and was on scene 12 minutes later. The cruiser with 2 people on board was drifting, and was taken in tow back to Rhyl. As the boat was approaching Rhyl harbour, the ILB was launched to act as a brake going into the harbour, and the vessel was safely moored on the outer pontoon. The AWB and ILB returned to station at 2250. “Lil Cunningham” returned to Rhyl to be the station boat after engine checks. “Fisherman’s Friend” 12-33 was returned to Conwy marina for relief duties. “Lil Cunningham ” 12-24, our station boat, required repairs on her engines. The boat was taken by sea to Conwy marina and was replaced by “Fisherman’s Friend” 12-33. The AWB was paged in near gale-force winds and a rough sea, to a PWC (Personal watercraft – Jetski) that had broken down and was drifting about 1 mile out from the shore at the rainbow bridge, Llandulas, in a westerly wind and flood tide, pushing it towards Rhyl. A small rigid-inflatable (RIB) had gone out to assist, but it was on the limit for that type of craft, and when the lifeboat crew arrived on scene 25 minutes later, they found the RIB crew towing the PWC, but the Jetski rider was actually in the water, holding on to the Jetski, going about 5 miles per hour. A crew member went overboard to assist the rider, and get him to the lifeboat. 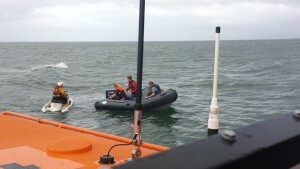 Once the casualty was on board, he then went back to the Jetski to get a tow with the lifeboat. This was successfully completed, and the Jetski was towed back to Old Colwyn. The casualty was then taken to shore by the RIB and the Jetski also taken to shore. Despite being in the water for about 90 minutes, the man was OK and declined medical help on shore. 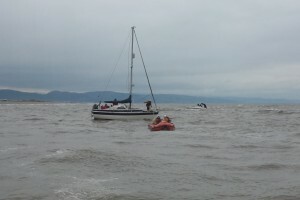 The lifeboat crew supervised the beaching and then returned to Rhyl by 5pm. The man, and the RIB crew were given some safety advice by the local coastguard on their return to shore, as this service could have ended differently if thje Jetski was about a mile further out, in the breaking seas and strong winds and rain. Coxswain Martin Jones says “The casualty was lucky the sea was still warm from the Summer.The seas were nearly on the limit for a small RIB. If any vessel puts to sea, they should inform the local coastguard to inform them of their intentions. This applies to both the casualty, and any vessel that goes to assist them”. AWB paged to launch to meet up with a windfarm support vessel 5 miles out, which was transporting a male from one of the larger windfarm boats, who had become unwell and required medical checks. The transfer of the male between the support vessel and the lifeboat was carried out smoothly, and the lifeboat crew ferried the man to shore to be handed over to paramedics at 0945. Both boats were launched just before the start of the second day of Rhyl Air Show, to assist a private small hovercraft, who had lost steering in the surf at Splash Point, to the east of the end of Rhyl promenade. The ILB was on scene first, and the hovercraft was just in the surf line, about 10 metres from shore, and was being washed over by the waves. The ILB crew helped the hovercraft crew get the vessel ashore, just as the AWB arrived. The ILB crew then came out to the AWB to transfer a portable pump to shore, where they successfully emptied the hovercraft so that the local beach Lifeguards could recover the craft on to it’s trailer, and tow it back to the boathouse. The AWB and ILB were then recovered and got back to station just as the show was starting at 1412. Both boats paged due to weather conditions – person in the water at Pensarn, Abergele. As the crew were assembling, Holyhead Coastguard reported the man was now in police custody, so both boats stood down at 2053. Classed as standby for both boats. The AWB was tasked to assist in the releasing of a distressed stranded dolphin in to the open sea, after it had become disorientated and swam up the river Dee nearly to Chester. Rhyl AWB met with Flint ILB who were transporting the mammal at Mostyn Docks. The AWB then led the ILB from the River Dee, and the mammal was carried to a point 6 miles north of Rhyl, and then both Flint and Rhyl crews got the dolphin into the water and gradually released it. AWB called out to evacuate a sick worker from a windfarm support vessel on the wind farms north of the station. Helicopter from RAF Valley also tasked. 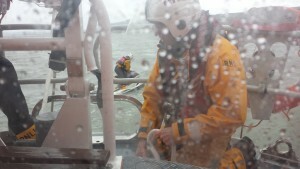 Casualty evacuated by helicopter with assistance from lifeboat crew and the wind farms’ own emergency evacuation team. Lifeboat returned to station at 1100. Both the ILB and AWB were launched after Holyhead Coastguard received a 999 call regarding a small inflatable blowing offshore at Kinmel Bay. The ILB launched first, and came up on a small inflatable with no-one on board. The inflatable was some way off shore, and so both boats commenced a shoreline search to see if there was anyone in the water or if someone would wave from the shore. After half an hour, no-one had attracted the crews’ attention, so the search was called off as no-one had reported anyone missing. Classed as false alarm with good intent. Both boats returned to station at 1700. The AWB crew were paged at 2055 pm to go to the aid of a wind farm support vessel which had experienced an engine room fire. The fire had been successfully fought by the crew, but one of them had sustained an injury. This was being treated and monitored by the wind farm’s own emergency response team.The lifeboat came alongside and three crew went on board the vessel to assist the emergency team until the arrival of a helicopter from RAF Valley. The injured person was airlifted and taken to Bodelwyddan hospital. Even though the wind farm support vessel had successfully fought the fire, there was still a chance the fire may re-ignite, so after consultation with the lifeboat coxswain, it was agreed the vessel would make for Rhyl harbour with the lifeboat in attendance. This was undertaken at slow speed and successfully done by 11.20pm. The vessel was moored in Rhyl harbour so fire officers could board and check it over. As all was well, the lifeboat crew returned to station by 00.30 in the morning. Both boats were launched to assist Rhyl coastguards and police search for a distressed male in the water between Rhyl and Prestatyn. As the ILB was launching, the coastguards saw the man in the water from the glare of a parachute flare, and were able to direct the ILB to the scene. The ILB crew assisted the coastguards to get the man from the water, just as the AWB arrived. The AWB stood off from the beach until the male was helped ashore, and helped to an ambulance. The male was transferred to the ambulance, and the ILB crew then returned to station, shadowed by the AWB. All units were back on station at 0315. The AWB was launched to a dive boat 11 miles north of the boathouse, after a diver coming up was stung on the face by a jellyfish. A helicopter was not available, and so it was agreed that the dive boat would motor towards Rhyl to meet the lifeboat. This was accomplished about 6 miles out, and the casualty was transferred to the lifeboat to return to station. The man was given casualty care and put on oxygen until the lifeboat reached shore, where paramedics met the boat on the beach. The man was checked over as the boat was recovered, and he was taken to hospital in the ambulance . The boat was ready for service at 1700. AWB crew paged to launch to a medical evacuation of a sick man on board the windfarm accommodation vessel, 5 miles off Rhyl. The boat launched, and Holyhead coastguard also tasked the RAF rescue helicopter as it was in the area. Both units arrived on scene together, and the AWB stood off as the winchman was lowered on to the vessel to assess the casualty. He was assessed as OK to be flown to Glan Clwyd hospital, so the AWB stood off until the man was on board the helicopter and on his way to hospital. The lifeboat then was released, and returned to station at 1330. The AWB was launched to tow a broken down leisure fishing boat back to Rhyl after its engine had stopped. The tow was undertaken until the lifeboat reached Rhyl harbour, where it could not pass under the new pedestrian bridge. The ILB was launched and took up the tow to get the casualty back to its mooring, both boats returning to station at 1517. Both boats were launched to a report of a capsized kayak off Pensarn, Abergele. North Wales Police thought it was a hoax, but the lifeboats continued, and found a man with a kayak on the beach. He said it was him who was fooling around in the water, and apologised for his getting the emergency services involved. All units were stood down, the lifeboats returning to station at 1634. The AWB was requested to launch after Holyhead Coastguard reported a broken down Jet Ski to the west of the North Hoyle windfarm. The owner was safe but his vessel would not start. The boat launched to the previous call, and had been going for about 10 minutes when another call came in of a Jet Ski taking in water off Prestatyn. As this was more urgent, the AWB diverted and the ILB was also launched. Both lifeboats arrived on scene together. The Jet Ski and owner had been taken in tow by a speedboat, but this was not able to make headway, so the vessels were at anchor when the lifeboats arrived. (see picture on ILB services entry). The ILB crew took over the tow, and the AWB was diverted to the original call at the wind farm. The AWB arrived on scene and started a search for the Jet Ski. The vessel was found after about 20 minutes, about 1.5 miles from his original position. A crew member went into the water to check the intake of the Jet Ski and found debris and seaweed blocking the intake. This was cleared and the owner managed to restart the engine after about 10 minutes. He had done the right thing by staying and sitting on his craft until help arrived, as he was about 5 miles offshore. The Jet Ski was restarted and started making way back to Colwyn Bay, where the owner had launched from. The lifeboat shadowed the vessel for about 10 minutes, but then the owner managed to get full power; said he was ok; and returned to Colwyn Bay. The AWB arrived back in Rhyl at 1555. AWB crew paged to immediate readiness to support teams on Gwynt-Y-Mor easterly transformer station, after a report of smoke on the lower platform. The windfarm’s own people went on to the platform after smoke was seen on CCTV cameras, but all was well and the boat was stood down at 0900 from the shoreline, returning to station at 0915. Classed as standby. Both boats’ pagers were activated to assume a search for a missing kayaker. The vessel had been on Rhyl beach over 24 hours, and the owner was not around. As the boats were coming out of the boathouse, Holyhead Coastguard reported that the owner had been traced to a local B & B house. He had not informed the coastguard he had been going round the coast on a charity event, but had decided to stop the event due to back problems. As all was well, both boats were stood down at 2122. Both boats paged to search for a missing child off Presthaven sands caravan camp, Talacre. As the crews were assembling, the coastguard reported the child had been found safe and well. Classed as standby. Stood down at 1555. The AWB was requested to launch after Holyhead coastguard received 999 calls regarding a man parted from a capsized PWC (personal water craft – Jet ski) between Abergele and the Rhyl Flats offshore windfarm. The AWB was launched, and on way to the area, was informed another jet ski had gone out and recovered the man, but the vessel was still a hazard to navigation near the windfarm. The coastguards on shore attended to the man who refused medical assistance. The AWB crew located the flooded vessel, and towed it back, still partially submerged, to the beach at Rhyl. The owner later came to the station to recover the PWC. The AWB was back on station at 1815. The AWB crew was paged after a 24-feet power boat reported they had a fouled propeller off Pensarn, Abergele. The AWB was launched and located the vessel with 2 people on board, some 4 miles west of the station. The boat was taken in tow back to Rhyl harbour. The AWB returned to station at 1501. AWB paged to assist Flint lifeboat and coastguards, in a search for a male who was reported to have jumped off the Blue road bridge at Queensferry in the River Dee, and was last seen floating down stream towards Mostyn docks. Flint had been searching for about 30 minutes, and the AWB was requested by Liverpool Coastguard to act as a sentinel around the docks area to check if anything was being swept out to sea. On arriving at Mostyn docks about 35 minutes later, a localised search of the moorings and slightly upstream was started, but then the coastguard reported the mobile phone number given was out of use, and the first informant’s address was also false. The boats were therefore stood down, Rhyl AWB returning to station at 1610. This is being classed as a hoax. 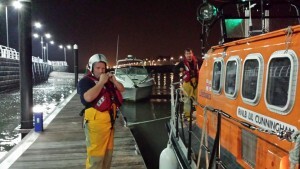 Both boats launched to 2 vessels in difficulty on the rock groyne at the entrance to Rhyl harbour. the first power vessel had engine failure, and a yacht had gone to their aid, but had caught the rocks and lost the rudder, resulting in the both boats going over the rock groyne and being in danger of being washed ashore. The ILB launched first and established a tow on the yacht to take it clear of the rocks and the shore. The AWB followed up, and arrived on scene to find the power vessel’s crew had restarted the engine and it was making it’s way back round the groyne to Rhyl harbour. The ILB continued the tow until there was sufficient water for the AWB to take up the tow. this was successfully completed and the yacht and it’s 5 passengers were towed safely back to Rhyl harbour. Once it was established that both casualties were safe, the lifeboats returned to station at 2000. The picture taken from the AWB shows the ILB towing the yacht to deeper water, with the power vessel entering the harbour. Both boats requested to launch to a person threatening self-harm in the water off the Sky Tower at Rhyl. As the crew were assembling, Holyhead Coastguard reported the ambulance service had the person in their vehicle and so all units were stood down. Classed as standby. AWB crew paged to launch to search for 2 missing divers from Dive Boat “Marlin”, 11miles off Rhyl. As the boat was just launching, the dive boat reported they had found the divers on the surface, all was well. AWB and also Rescue Helicopter from RAF Valley stood down. Boat returned to station at 1621. Classed as AWB standby as boat didn’t launch. Holyhead Coastguard were requested for lifeboat and local coastguards to help North Wales Police search for a missing person who had left their car at Talacre Beach, with a note and the keys still in the car. Due to the sea and wind conditions, the AWB was launched and was on scene some 25 minutes later. The search had been going on for about half an hour , with Flint ILB requested to back up in the River Dee, when the police reported the person had been found ashore. all marine units were stood down. The AWB crew had an uncomfortable 9-mile journey back to station, having to shelter from the force 9 winds in Rhyl harbour, until there was sufficient beach to recover. the crew were back at the boathouse at 1430. North Wales police reported to Holyhead Coastguard that they had discovered a male in the water, walking out to sea off the Seaquarium by the boathouse. Both boats and local coastguards were tasked but as the crew were assembling, the police reported they had entered the water to get the man back, and he was now in police custody. All units were stood down at 2315. Classed as standby for both boats.